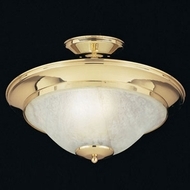 Hi-Lite Fixtures- American Made ~ Guaranteed Best Pries! Ingenuity and ambition are proud American traits, and Hi-Lite Manufacturing Company, a premiere lighting manufacturer, has those traits in great abundance. 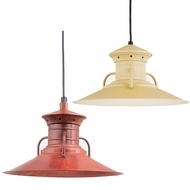 Specializing in barn lights and other classic styles, these Hi-Lite affordable light fixtures are 100 percent manufactured at their 200,000-square-foot facility in Southern California. Since 1968, they have built a reputation for working with the finest materials and creating exciting designs, from the initial production through painting and finishing. This gives them complete freedom and flexibility to oversee every aspect of the manufacturing process, resulting in uncompromised quality and enduring style. Their collections include ceiling lights, pendant and island lights, chandeliers, wall sconces and vanity lighting, outdoor post lighting, outdoor hanging lights, outdoor wall lighting and stylized pot racks. American-made quality and affordability never looked so good. Their ceiling lights are available in different styles and finishes such as satin steel, chrome and rosewood. There are chandeliers with wagon wheel designs or nautical themes. Choose from bold designs and presentations that are more delicate and understated. The chandeliers with barn light styling are perfect for rustic settings, and you'll also find artistic designs with Asian flair. The various looks, from vintage to contemporary, are carried over to their island lighting and pendants. These fixtures are designed especially for kitchens, with certain models focusing light downwards for effective task lighting. 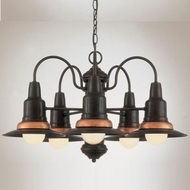 The various finishes let you easily match your lighting fixture to existing home décor. 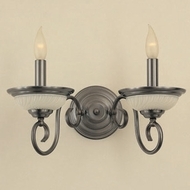 Wall sconces are attractive as accents and they provide additional light in living rooms, foyers, hallways and bedrooms. There are barn light sconces, Victorian sconces and contemporary sconces. From the Far East to European to vintage American, there is a wall sconce to fit the personality of any room. 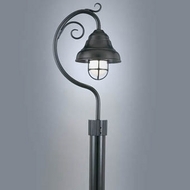 Hi-Lite's outdoor lighting collection is just as impressive. 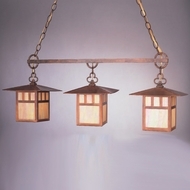 Browse traditional, contemporary and transitional lighting in different fixture types such as post lights and pier mounts, outdoor pendant lights, vapor jar pendants and outdoor wall sconces. 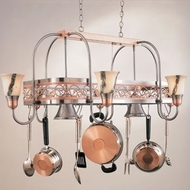 The company also makes distinctive pot rack and ceiling light fixtures, uniquely styled for traditional, rustic or modern kitchens. AffordableLamps.com prides itself on presenting the finest lighting companies in one place and offering our customers the best deals anywhere. Take advantage of our 125 percent low price guarantee! We'll match any competitor's price and will give you 25 percent of the difference.